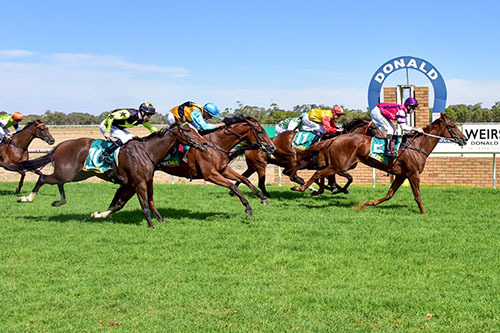 It was a well-deserved win for consistent Mare Miss Damita when she saluted in the BM 58 over 2000 meters at Donald on March 21 after a most encouraging campaign to date. This Daughter of Ocean Park has really enjoyed the move down to Mick’s Warrnambool base from Caulfield under the watchful eye of Matthew Williams who has done an absolutely superb job with her and her consistency throughout this campaign is testament to just how important this Warrnambool base is. For a lightly framed Mare who had her troubles in maintaining her weight at Caulfield, where everything seemed to worry her and she would lighten off very early in her previous preparations, Warrnambool has been responsible for her now winning at what was her 9th run this time in, something unheard of from her previously. 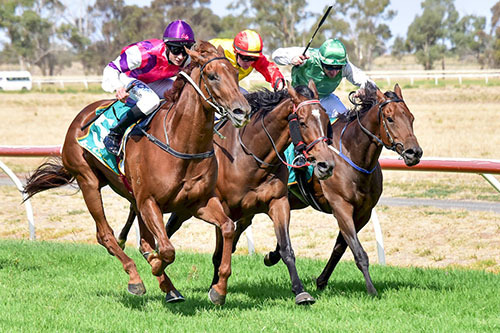 She commenced this prep way back in September at Wangaratta and has raced consistently all throughout with 1 win,1 second,2 thirds and a 4th. Miss Damita was given an absolute peach of a ride by promising apprentice Zac Spain who could have not ridden her any better and settling mid field throughout, Zac got Miss Damita to the outside at around the 800 meter mark and gave her clear running throughout when he made his move and was challenging strongly just prior to the turn. On straightening, Miss Damita came with a well-timed run and sprinted clear to win being eased up on the line by three quarters of a length from San Gregorio with Harbour Express filling third. A NZ $58,000 weanling purchase, Miss Damita is well on the way to recouping that having earned now $37,600 in stakes and the thought is that she will continue to improve particularly going into next prep, as she is a lovely sound Mare and very easy to train!